Electric Vehicle Battery Systems provides operational theory and design guidance for engineers and technicians working to design and develop efficient electric vehicle (EV) power sources. As Zero Emission Vehicles become a requirement in more areas of the world, the technology required to design and maintain their complex battery systems is needed not only by the vehicle designers, but by those who will provide recharging and maintenance services, as well as utility infrastructure providers. Includes fuel cell and hybrid vehicle applications. 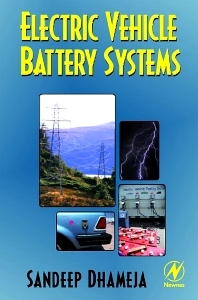 Written with cost and efficiency foremost in mind, Electric Vehicle Battery Systems offers essential details on failure mode analysis of VRLA, NiMH battery systems, the fast-charging of electric vehicle battery systems based on Pb-acid, NiMH, Li-ion technologies, and much more. Key coverage includes issues that can affect electric vehicle performance, such as total battery capacity, battery charging and discharging, and battery temperature constraints. The author also explores electric vehicle performance, battery testing (15 core performance tests provided), lithium-ion batteries, fuel cells and hybrid vehicles. In order to make a practical electric vehicle, a thorough understanding of the operation of a set of batteries in a pack is necessary. Expertly written and researched, Electric Vehicle Battery Systems will prove invaluable to automotive engineers, electronics and integrated circuit design engineers, and anyone whose interests involve electric vehicles and battery systems. Sandeep Dhameja has experience in high-speed and broadband, xDSL and VOIP, wireless data network infrastructure design, data network security and network intrusion detection of large area networks and e-Business solutions. He was formerly Senior Consultant at Center of Technology Enablement, Ernst & Young LLP,Chicago. He also participated in the electric vehicle development and production program at Chrysler.